FF2 Media congratulates Jill Soloway on Outstanding Directing in a Comedy Series for Transparent and Susanne Bier for Outstanding Director in a Limited Series, Movie or Special for The Night Manager. With a range of diverse nominees and winners, the 68th Primetime Emmy Awards is a sign of the times: the Television Academy is the tortoise and AMPAS (the Academy of Motion Picture Arts and Sciences) is -- without a doubt -- the hare. Why so behind the times? The problem does not lay in the quantity of female-led projects, but rather the quality of recognition and distribution. For the past few years, FF2 Media has vowed to cover each and every film opening in NYC that was either written &/or directed by a woman filmmaker, from the biggest of blockbusters to independent videos on demand. That's why we have seen hundreds of films, including Soloway’s Afternoon Delight and Bier’s In a Better World. On FF2 Media, we prove week-by-week, month-by-month, and year-by-year that wonderful films by women filmmakers are definitely out there. But if AMPAS does not take notice of the progress that women are making behind-the-scenes (on screens big and small), they will be lapped in the race of relevancy. 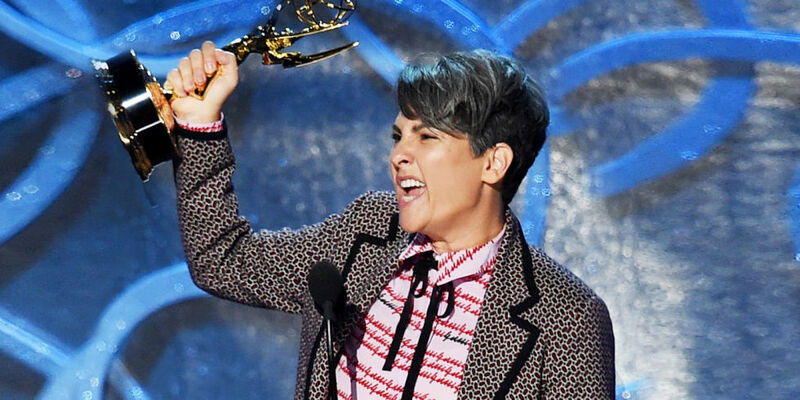 [From IMDb]: Jill Soloway was born on September 26, 1965 in Chicago, Illinois, USA. She is a producer and writer, known for Transparent (2014), Six Feet Under (2001) and Afternoon Delight (2013). [From IMDb]: Susanne Bier was born on April 15, 1960 in Copenhagen, Denmark. She is a director and writer, known for In a Better World (2010), After the Wedding (2006) and The Night Manager (2016). She is married to Jesper Winge Leisner. Thanks to Brigid & kudos to all of the 2016 Emmy Award winners. I would like to add my personal Wow! Wow!! Wow!!! to The People vs OJ Simpson team which won writing & directing awards as well as awards for three stars (among all those nominated in its huge, phenomenal cast). In December 2014--a little less than 2 years ago--I met Larry Karaszewski at a Big Eyes screening, and we have been "FB Friends" ever since. In February (2016), I sent him a "You Go Guy" message about The People vs OJ Simpson, and he wrote back: "Can't wait to hear what you think of episode six. We really explore all the crap Marcia had to put up with..."
Larry: You now have your answer, not just from me, but from the world. What you and your writing partner Scott Alexander have done for Marcia Clark, Sarah Paulson, and women everywhere--both on screen & off--is monumental, and on behalf of FF2 Media, I thank you for changing the way the OJ Simpson story will be remembered forever more. Hooray for the whole superlative The People vs OJ Simpson team!!! Kudos on all your well-earned Emmy wins!!! If I ruled the world, then Larry & Scott would have received Oscars for their Big Eyes screenplay, and Amy Adams would have received a Best Actress Oscar (which I am sure she would have dedicated to Margaret Keane, just as Sarah Paulson dedicated her Emmy to Marcia Clark). Of course, I don't rule the world, but with men like Larry & Scott creating parts like these for actresses like these, I feel better about the future... week-by-week, month-by-month, and year-by-year!